Seems too expensive to be a good tempo play. For 4 mana it would be awesome, for 5 it can see play, but in what type of deck? Flanking Strike is more consistent, really depends on how weanie the meta is, and if these controlly midrange hunter decks can keep up. To live is to suffer, to survive is to find meaning in the suffer! 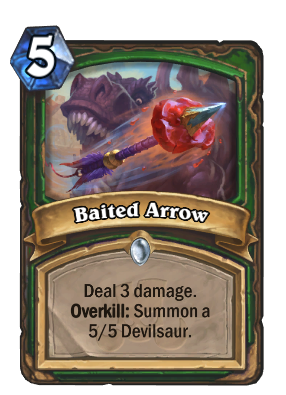 flanking strike is far more consistent, but spell hunter having plenty of ways to deal damage makes this card possible, and the payoff is pretty good. Well, this with Candle shot is pretty interesting... but a 4 mana 3/3 battlecry deal 3 is better than a 5 mana 5/5 battlecry deal 3. Plus the conditional might not always go off. You need to kill something with 2 or less health to get the 5/5 devilsaur. Seems a bit clunky. Read this as 5 mana 5/5 deals 2 to a minion. At best. But even that is not crazy good. Shouldve been 4 mana to keep it interesting. Hunters will get their devilsaurs easier and cheaper. Exactly. Plus 5/5 vanilla is poor. In current Cube Hunter you got those 5/5s for like 4 mana on turn 3 or 4. To go infinite, besides Play Dead, you also have triggers like Terrorscale Stalker, Carnivorous Cube, Mossy Horror... And those are not even the reasons why Cube Hunter is a great deck, but it's all about Deathstalker Rexxar. Then how to expect this card to work instead of Flanking Strike or Wing Blast? Neither Spell nor Odd Hunter need this card. Seems good on paper, but it is just "pay 5 mana to get a 5/5 and kill a weak minion or a minion already on the verge of death". I'd rather just add an actual 5 mana 5/5 that does something useful (like Seaforium Bomber) instead of this and just kill the weak (or weakened) minion with a Flanking Strike or by trading something into it. It is almost like playing Bane of Doom with a guaranteed 5/5 minion and no option to go face. I wouldn't call that a garbage. In a world where Flanking Strike is still in rotation, this seems bad. Even after rotation 5 mana 5/5 kill a minion with 1-2 health? I don't know if its even good in that environment. This is one of those cards that is too powerful to be 4 mana, but probably not good enough for 5.